Everyone wanted Aaron Rodgers after his incredible 2011 season. In fact, the Aaron Rodgers demand was so high that he compiled the single greatest ADP of any quarterback in the history of fantasy football. I didn’t get it. I mean, I understood the concept of value and the notion that obtaining one of those high-scoring, elite quarterbacks was key – in the minds of many – to fantasy football success in 2012. 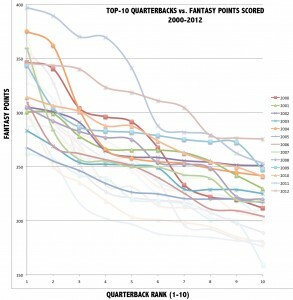 But the fantasy football public acted as if the 2011 quarterback value feat had never been done before. The reality: we’ve seen a large variance in quarterback play like this many times in the past. Sure, multiple passers threw for over 5,000 yards in 2011. And three broke the 40-touchdown barrier. We’d never seen it before; it was a rather mind-boggling thing to view. The season’s grand features, however, clouded our true judgment of fantasy value. The fake sport has been played for years. And when you listen to fantasy veterans – I’m talking about the guys who have played for thirty years – you’d find that the game has changed. Could you imagine playing through snail mail, calculating each player’s score with pen and paper? Right. Now we have the Internet, The Google and The Twitter. But I think that’s precisely been the problem. The game has gone so mainstream that we’ve lost sight of history. The sport of football has certainly changed; quarterbacks throw the ball more, defenders can’t crush defenseless wideouts in the head and the old-school bruising tail back has transformed into a lean, finesse one. The rules of fantasy football, however, remain fairly similar. You started one quarterback on your team twenty years ago, and you still do today. Perhaps the standard “touchdown only” leagues have moved to a more detailed format, but the gist remains the same: the way you win fantasy football is by selecting the most valuable team possible. To obtain value, you have to compare relative worth within a position. 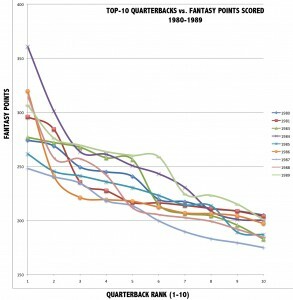 And folks, over the course of 30-plus years, this relative worth has changed little in regards to fantasy quarterbacks. The mishmash of lines may make your brain explode, and I get it. Alone, there’s not a whole lot you can take away from the graph aside from the fact that 2011 was a pretty big outlier, and the 1991 season was one of the worst, statistically, for passers. 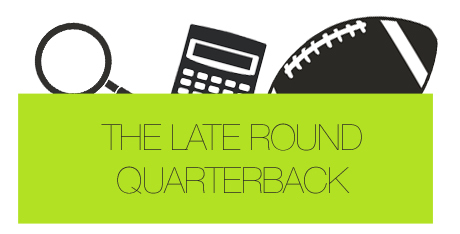 But when you separate this plot into three chunks – the 1980’s, 1990’s and 2000’s – you can begin to see the lack of change in quarterback value over the past 30 years in the NFL. The purple line you see representing the 1984 season is mighty tall thanks to Dolphins’ quarterback Dan Marino. His famous ’84 season consisted of 48 touchdowns and over 5,000 yards passing. Only Steve Young (1998), Daunte Culpepper (2004) and Aaron Rodgers (2011) have posted a higher fantasy total than Marino did that year. Also, you’ll notice that each of these lines have very different shapes to them. 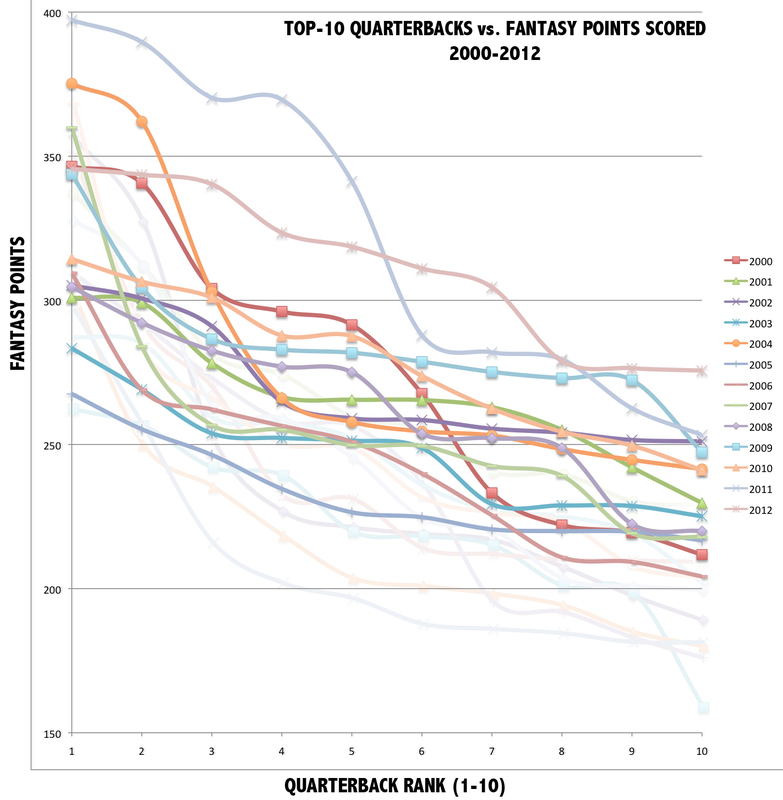 When we speak of value in fantasy football, we’re talking about the slope of these lines. The larger the steepness, the more valuable the player – to the left in this case – is to fantasy football. 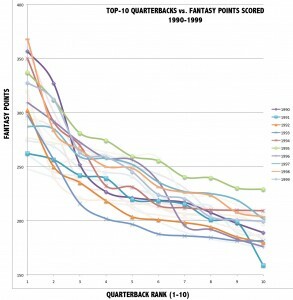 If you take a look at 1986, for instance, you’ll notice the top signal caller scored a lot more fantasy points than quarterbacks two through 10. This passer, Dan Marino, was an extremely valuable asset in fantasy because he so much better than his quarterback peers. This, in the end, is what the concept of value based drafting attempts to capture before a season begins. Randall Cunningham was a fantasy football monster in the late 80’s and early 90’s. In 1990, the Eagles quarterback threw 30 touchdowns and rushed for five more. The biggest reason he scored the fifth most fantasy points by a quarterback in history, however, was because his legs carried him for almost 1,000 yards on the ground that year. He, for all intents and purposes, was the 90’s fantasy version of Michael Vick. The difference? He was effective through the air, too. The 90’s were very interesting from a fantasy quarterback perspective. You could make the argument that elite quarterback play back then was better than it is today. 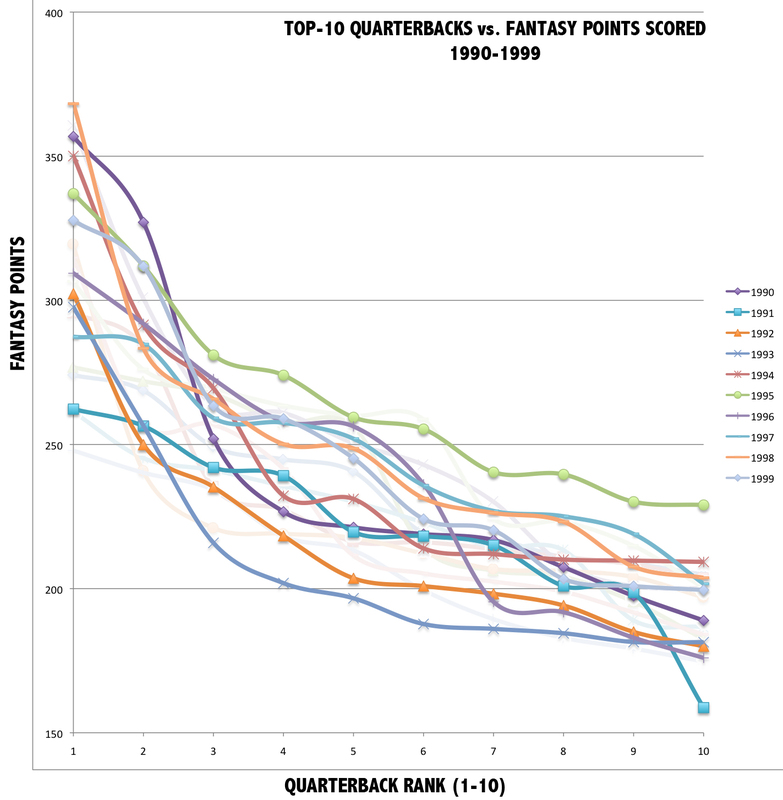 From 1990 to 1999, there was only one season – one – where the top signal callers didn’t outscore the 10th best player at his position by 100 or more points. In the 13 seasons since (2000 – 2012), the top quarterback has outscored the worst starter in a standard 10-team league just five times (38%). We’ve dubbed Aaron Rodgers, Drew Brees and Tom Brady one of the best elite classes of all time. It’s no different than what we saw in the 90’s, though. Steve Young was the best fantasy quarterback for three straight seasons. And moreover, Young’s 1992-1994 stretch saw him outscoring the 10th best fantasy quarterback by over 100 points each season. And once Brett Favre made it big, the fantasy community had to recognize it. He was the top fantasy quarterback each year from 1995-1997, and in 1998 was only beaten out by – you guessed it – Steve Young and Randall Cunningham. The trio of quarterbacks not only ranked high consistently year-to-year, but they outscored their competition by more points than Brees, Brady and Rodgers have theirs. Don’t forget about this history. It’s important. The 80’s had just a few unbelievable quarterback performances, while the 90’s saw a clear shift in elite quarterback play. At the turn of the century though, the low-end QB1’s caught up. As noted before, the majority of quarterback seasons from 2000-2012 have resulted in little variance. 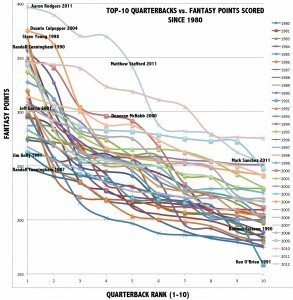 In 2002 and 2003, the top signal callers outscored the 10th best ones by just over 50 fantasy points. On a week-to-week basis, that’s a fairly minimal number. 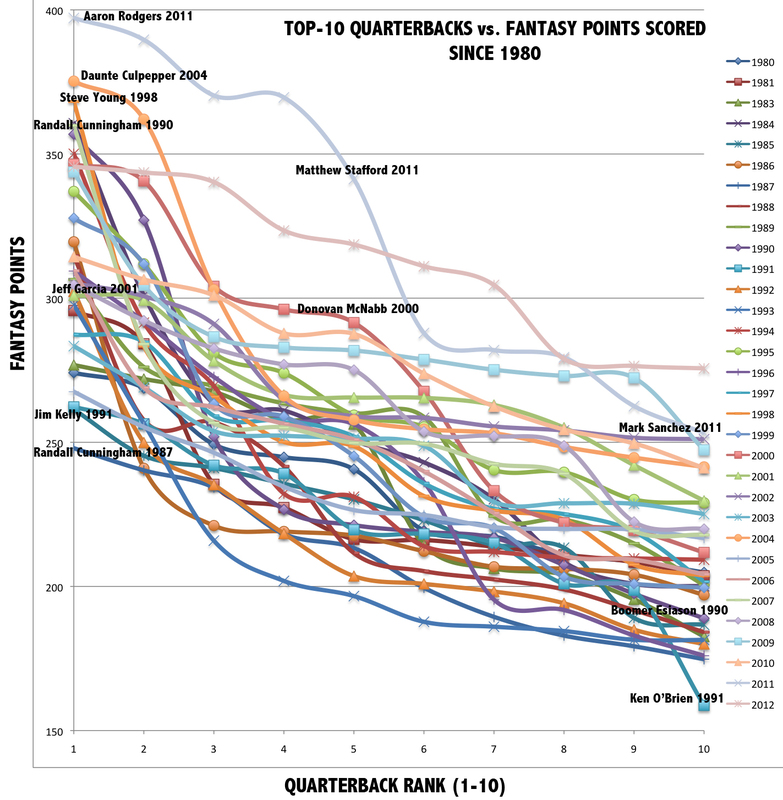 A lot of that has to do with the fact that the “bad” fantasy quarterback starters got better. The 200-point mark wasn’t even reached by a handful of 10th-ranked passers in the 80’s and 90’s, but in 2000, the hypothetical worst starter in a 10-team league reached 200 points on the reg. 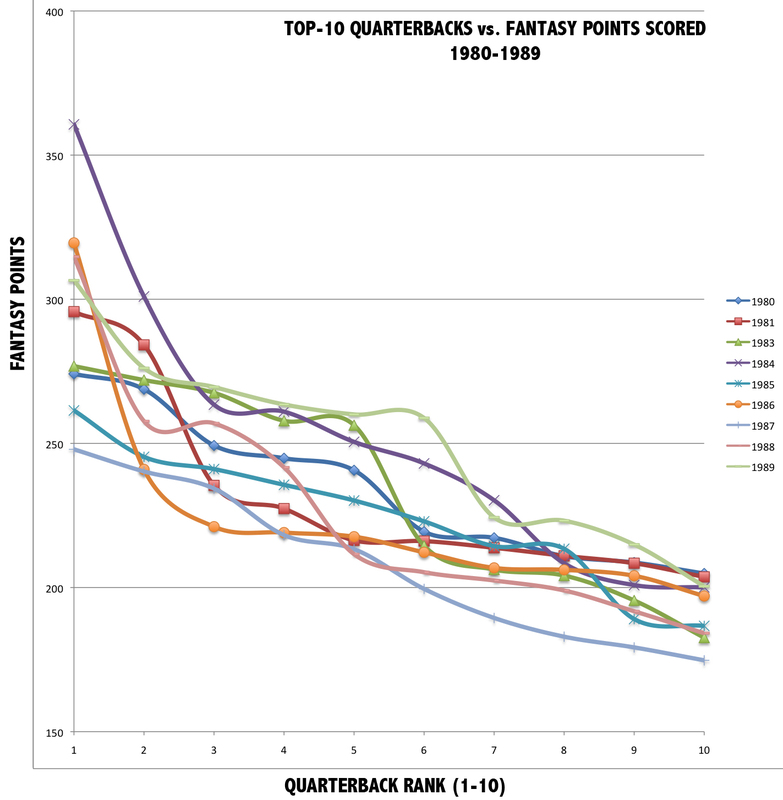 In fact, 230 or 240 points became the norm for low-end fantasy quarterback starters once 2000 hit. The transition from the 80’s to 90’s to 00’s is an interesting one. You can see a clear shift upwards from the 80’s to 90’s on the left side of the graph, but the shift occurs more on the right side when the 00’s hit. In other words, true elite quarterback play in fantasy football occurred in the 1990’s, not necessarily in our current era. Why? Why are we holding the quarterback position to a higher standard in recent times than it has been historically? Go ahead and ask any veteran fantasy player – they’ll tell you the late-round quarterback strategy is one they’ve practiced for years. And when I say years, I’m including the 90’s, and in some cases, the 80’s. The reason is simple: It maximizes value for your fantasy football team. Perhaps the popularity of fantasy football has forced mainstream outlets to ignore history because the typical fantasy player doesn’t understand the history. It’s easy to conclude a quarterback is valuable because, of course, they’re the most valuable player on a real football field. But as I say, fantasy football is different. The position matters about as much as the bologna sandwich you had for lunch.